These systems are designed to protect storage spaces. The following sprinkler types are specific to the protection of high-piled storage. They are normally installed in large warehouse-type buildings with a high level of combustible fuel loading. The sprinkler design requirements of storage occupancies are based on multiple factors including ceiling height, storage height, commodity type, storage configuration, and aisle width. In-Rack. Depending on the level of combustible load provided by the commodity being stored, a special subset of sprinklers is required within the rack structure itself. These in-rack sprinklers offer many design challenges and may require a high degree of owner controls to maintain compliant flue spaces and clearances. Control mode density area (CMDA). CMDA sprinklers refer to a specific type of sprinkler listed for control of fires in storage applications. It is possible to confuse standard sprinklers with CMDA sprinklers, as the control mode density area method of protection of storage occupancies is synonymous with the standard occupancy hazard fire approach used in most other occupancies. CMDA sprinklers, like many storage sprinklers, are distinguished primarily in the available higher temperature ratings and larger orifices sizes. Control mode specific application (CMSA). CMSA sprinklers refer to a specific type of sprinkler listed for storage applications with increased severity fires. The primary difference between CMSA and CMDA sprinklers is that the former create a larger water droplet, which allows greater penetration of the high-energy fire plume and increased fire control performance. CMSA sprinklers have different design requirements than CMDA sprinklers, sometimes offering a hydraulic benefit compared to CMDA protection. Early suppression fast response. Early suppression fast response sprinklers are intended to provide the highest level of performance against high challenge storage fire scenarios. These sprinklers utilize a high initial pressure and quick-response element to discharge high velocity water deep into the seat of a fire. 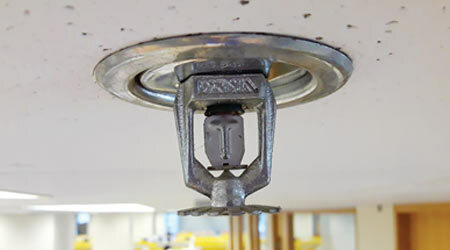 Early suppression fast response sprinklers are designed to suppress a fire early in its growth, and as such do not require the installation of in-rack sprinklers. Early suppression fast response sprinklers have stringent requirements that are not typically encountered by other storage sprinklers including: They are prohibited for use on dry systems, have more stringent installation requirements, and require an increased minimum distance to the top of storage. However, where applicable, early suppression fast response sprinklers provide protection for the widest range of commodities and can be a good design option for owners desiring flexibility.